On Sunday morning, September 29, 1946, Boston Red Sox general manager Eddie Collins and owner Tom Yawkey worried that their American League champs might have to wait several days before playing in their first World Series since 1918. The Brooklyn Dodgers and St. Louis Cardinals were tied atop the National League standings with one game remaining, so a three-game playoff to settle the pennant was a distinct possibility. The playoff, if needed, would begin on Tuesday in St. Louis, with an off-day scheduled on Wednesday for the teams to travel by train to Brooklyn. As a result, the start of the World Series would be pushed back from Wednesday until the following weekend. As the final day of the season began, Collins and Yawkey spoke with Cronin about scheduling three exhibition games in parallel with the National League playoff. Collins knew that the idea was not unprecedented. In 1910, Collins was the second baseman for the Philadelphia Athletics; when the first-place A’s completed their regular season, the Chicago Cubs, who had already clinched the National League pennant, still had eight games left to play. While the Cubs wrapped up their schedule, the A’s played five exhibition games against an all-star team organized by Senators manager Jimmy McAleer.4 “They gave us an awful drubbing,” Collins recalled in 1946, referring to the superstar cast that included Ty Cobb, Tris Speaker, and Walter Johnson that won four of the contests, “but they left us so sharp we went on to win the World Series with ease.”5 A year later, the A’s followed the same formula, playing four exhibitions against a similar squad before winning the Series again.6 Cronin agreed that an exhibition series would also benefit the Red Sox now. Boston split the remaining two games of the series. Hank Greenberg collected two hits as the All-Stars took the second game, 4-2.20 In the finale, Rudy York’s two-run homer off Hal Newhouser provided the winning margin in a 4-1 Red Sox victory.21 Meanwhile, the Cardinals swept the Dodgers to take the pennant. The 1946 exhibition series was the last of its kind. Despite calls from the American League to change to a single-game playoff, the National League continued to use its three-game format until divisional play began in 1969. Playoffs would be required in 1951, 1959, and 1962, but began the day after the season ended with no extra days reserved for travel (a change facilitated in part by a shift from using trains to airplanes).24 Since there were usually two scheduled off days between the end of the regular season and the start of the World Series, the tighter playoff schedule delayed the start of these World Series by only a day. As a result, the six-day gap between the end of the 1946 season and that year’s World Series would not be repeated, and there was no need for the American League pennant winner to schedule exhibition games while waiting for its National League opponent. 1 Hy Hurwitz, “York Only Sox Regular to Play Out Schedule,” Boston Daily Globe, September 15, 1946. 4 “Bosoxers Trim All-Star Club,” The Sporting News, October 9, 1946. Box scores of the 1910 A’s series are included in The Sporting News, October 20, 1910 (p4). McAleer’s involvement is mentioned in his SABR biography (http://sabr.org/bioproj/person/e6db627f) and in William Weart, “Mad for Tickets,” The Sporting News, October 13, 1910. 5 Wire story, “Red Sox to Keep Fit by Playing A.L. All-Stars,” Brooklyn Daily Eagle, September 30, 1946. 6 Box scores of the 1911 A’s series can be found in The Sporting News, October 12, 1911 (p5) and October 19, 1911 (p8). 7 Hy Hurwitz, “Sox to Play Series With All-Star Club,” Boston Daily Globe, September 30, 1946; Harold Kaese, “N.L. Playoff Plan Based on $$ Hunger, Desire to Cool Sox,” Boston Daily Globe, September 30, 1946. 8 Roster taken from Hy Hurwitz, “Sox to Play Series With All-Star Club,” along with the box scores of the three games in the Globe and a team photograph on page 8 of the October 9, 1946 edition of The Sporting News. Hy Hurwitz, “Hughson Hurls As Sox Blank All-Stars, 2-0,” Boston Daily Globe, October 2, 1946 mentions that Greenberg, along with Joe Page, Tommy Henrich, and Billy Johnson, did not appear for the series opener. Only Greenberg would play in the series, and only Greenberg and Page were pictured in The Sporting News. The Globe also listed Buddy Lewis on the original roster, but Lewis is omitted in “Red Sox Will Keep in Trim; Play All-Stars,” Chicago Tribune, September 30, 1946 and in The Sporting News. 9 Weather reports in Boston Daily Globe, September 29 through October 4, 1946. 11 Biography of Eddie Lopat on SABR http://sabr.org/bioproj/person/e3a049be; minor league statistics at http://www.baseball-reference.com/minors/player.cgi?id=lopat-001edm. 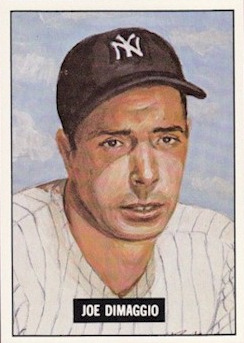 12 Hy Hurwitz, “Yanks’ DiMaggio ‘Sure Looked Good’ in Sox Uniform,” Boston Daily Globe, October 2, 1946. DiMaggio had a Yankees uniform shipped to him for the next day, in time for the team photo in The Sporting News; Hy Hurwitz, “All-Stars Even Series Against Red Sox, 4 to 2,” Boston Daily Globe, October 3, 1946. 13 Ticket prices mentioned in ads for the games in the Boston Daily Globe. 14 Harold Kaese, “Are Sox Vulnerable to Lefties?” Boston Daily Globe, October 2, 1946. 16 Hy Hurwitz, “Williams Hit on Arm, Hopes to Be Ready For First Series Game,” Boston Daily Globe, October 2, 1946. 18 Hy Hurwitz, “Injured Elbow Will Handicap Williams in Opener; Sox Head West,” Boston Daily Globe, October 4, 1946. 19 Hy Hurwitz, “Series to Start Sunday, Red Sox Waive Objection,” Boston Daily Globe, October 3, 1946. 21 Jack Barry, “York Homers, Sox Slap Down All-Stars, 4-1,” Boston Daily Globe, October 4, 1946. 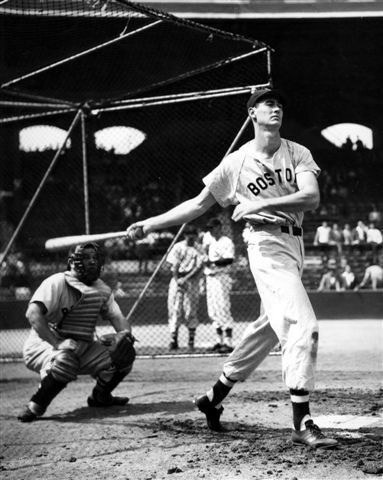 22 Jerry Nason, “Ted Belts Three Homers in Drill,” Boston Sunday Globe, October 6, 1946. 23 During the 1946 season Williams averaged one home run per 17.68 plate appearances. 24 Wire story, “Bums, Giants Tie for Flag; Playoff Today,” Milwaukee Sentinel, October 1, 1951. The 1951 playoff was a subway series between the Giants and Dodgers; by 1959 when the transplanted Los Angeles Dodgers faced the Braves, teams were regularly flying to the West Coast.